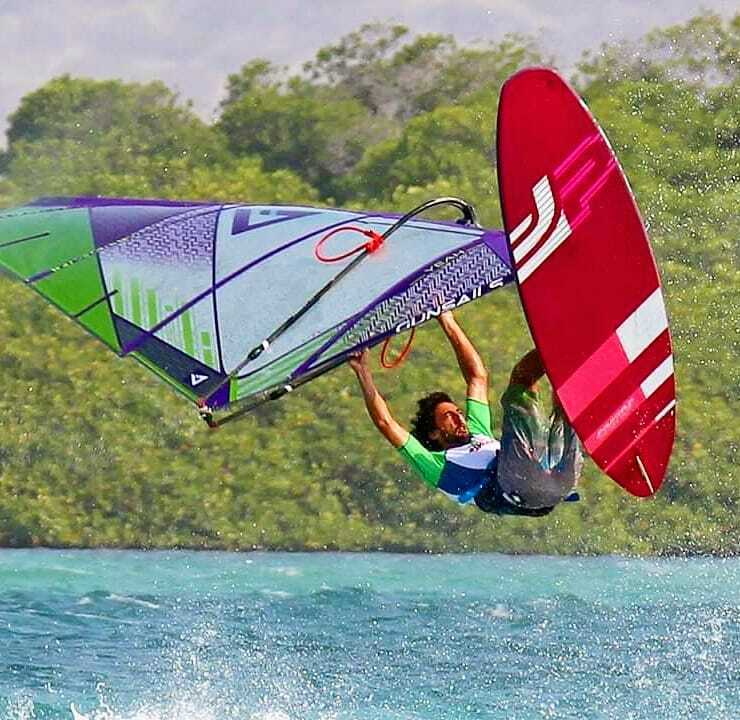 With the wind on the lighter side last week there was plenty of time for the registration for the King of Bonaire Event 2019. As a few international top riders like Davy Scheffers from Holland and Loick Spicher from Switzerland arrived on Bonaire one day after the actual registration day on Friday the 22nd, event organizer Julien Mas decided to set up another registration on Sunday afternoon. Everybody was around, as it became a big coming together of the Bonairean freestyle scene on a beautiful afternoon at Jibe City. Many cold Coronas have been sipped, whilst chatting latest move combinations and expectations of the event, followed by an awesome dinner provided by the Hang Out Beachbar at Jibe City. All the riders left with the deal, that as soon as there is a promising looking day in the wind forecast, the contest can get called on twenty four hours before. Four days later, on Wednesday March 27th, finally everyone got the call that the competition will be on tomorrow. Together with head judge Danny Kater, the event organization decided to run. As the forecast was not looking the best for the rest of the week, they chose the best day and wanted to give it a try. The skippers meeting was set for 7:30 am, because usually the wind is the strongest in the mornings and the evenings with a little drop around lunch time here at Sorobon. When the riders showed up at the beach in the morning the wind was on. With consistent twenty knots of wind, they chose sail sizes between 4.8 and 5.2m. The format of competition was simple: three minutes heat, with only one rider on the water, trying to show his or her best two moves, no matter which tack. Some riders got a bit nervous with the idea of sailing all by themselves in the area, with all eyes on them. But not like that, local power house Amado Vrieswijk, who set up the top score of the day (16,07 points) straight away in his first run. And that is a tough one to beat. The two counting moves of his run were two powerful and highly technical combinations: Air Bob into Culo plus an Air Funnel into Burner. But also other riders like Youp Schmit, Davy Scheffers, Antony Ruenes or event organizer Julien Mas started off strong, setting scores over 13 points straight away. On the girls side, Sarah Quita Offringa and Oda Johanne Brodholt were battling it out with very close scores in the 10 point range, landing power moves like Shove it Spocks, Culos and Shakas. When the wind dropped around 12 o’clock it was time for a lunch break at the hangout bar and they did an amazing job, serving a big portion of pasta for all the hungry riders. As the wind didn’t kick in as strong as expected in the afternoon, the kids went out for a few runs. They are light and always planing and they were happy to sail a bit after school. Local kid Patrickson Coffie impressed the judges with a very solid performance in his second run, setting a score of 9,42 points with a nice Shaka 360 on the inside and a Funnel on the outside. With the last sunlight of the day, the first day of competition came to an end and everyone was already looking forward to Sunday, which was the next windy day in the forecast. On Sunday morning it was windy again and everyone was motivated to beat his personal best score and maybe climb up the ranking with it. Many riders could improve on the second day, as they started to get the feeling for the short amount of time in the heat and the competition format in general. Event leader Amado Vrieswijk could not improve it though and had to rely on his top score of the first day. Riders like Nic Hibdige, Julian Wiemar or Taty Frans could improve their score of day one by more than one point, in the early runs of the morning, and climbed up the ranking a lot. But don’t cheer too soon. First local rider Björn Saragoza, who missed the first day of competition and who had to go for broke on day two, was coming in hard with a Flaka into Ponch and Culo into Spock, which scored 14,15 in total. And later Youp Schmit and Davy Scheffers could improve their scores and break into the higher 14 point range, with Youp in front of Davy by only 0,23 points difference. In the girls fleet Francesca Floris and Julia Pakosz put together better runs, but could not pose a risk to Sarah Quita’s and Oda‘s tight top scores for place one and two. Also Patrickson Coffies top score in the kids fleet could not be beaten on day two. In the afternoon, when everybody was exhausted, and nobody wanted to go for more runs, as the wind was not as strong as in the morning, there was no better way to finish the event with the price giving at the full moon party at Jibe. The DJ was playing mad techno beats and light wind freestyle legend Ceaser Finies was going for a night show right in front of jibe with his sail full of LED lights. What a way to finish this cool event. See you next year! We would like thank all the partners and sponsors of the event: Jibe City, Surfsnb, ABK-Boardsports, Bonaire Windsurf place, Hang out bar, Hole and Tricktionary. Last but not least a big shout-out to the EFPT for providing the live scoring system. All in all the event has been a good way to try a new format, to turn some ideas into reality and to give some fresh input to the competition scene of freestyle windsurfing. Because in general many things changing at the moment, for example with the EFPT being the qualifying series for the world tour. The freestyle discipline itself develops further day by day, so we have to make sure to keep up with the way how to judge it and how to make it more attractive for the spectators on the beach, because in the end its all about providing a great show at the spot, right ?